156 Pages. A single copy of the Winter 2011 issue of the PWC Newsletter featuring the 2011 National Specialty. Articles include an overview of the National Specialty by Betty Kramp. Informative articles covering the Performance events follow with Lynda McKee covering the Tracking event, Andria Filipponi-Maloney on Agility, Mary Matejcek on Obedience and Walter OBrien on Rally. Lynda McKee also reported on the Monday night Conformation and Obedience practice sessions. National Coverage includes many photo collages of all the events, as well as reports on the Trivia Nite, Banquet and a pictorial on the Judges Education. Specialty reports in this issue include the National Specialty, Columbia River PWCC, PWCC of the Western Reserve and Cascade PWCC. 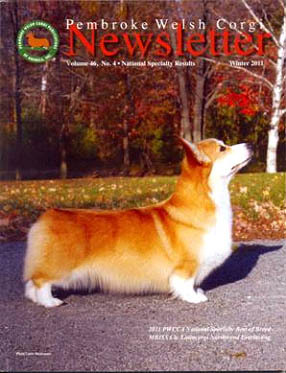 The Regional Talebearers reports feature the Ohio Valley Pembroke Welsh Corgi Club with pictures. Additional articles are info on the 2012 PWCCA Triathlon Challenge (in conjunction with the 2012 National Specialty in Portland, Oregon), Training to Trial Series by Carol Donnelly, Puppy Pediatrics by Sue Vahaly. Calendar of Events, PWCCA and PWCCPA Business information, Regular Editors Columns and color and b/w ads featuring PWCs.